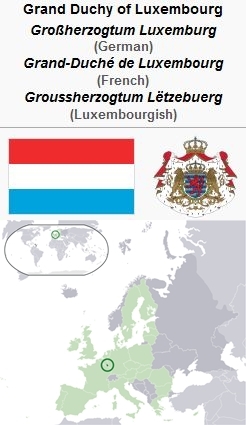 The Grand Duchy of Luxembourg is an independent constitutional grand duchy with an area of 2,586.4 square kilomtres (998.9 square miles; about the size of Lancaster County, Pennsylvania, USA) and an estimated population in 2010 of 502,202. In the year 2000 it was estimated that 87% of Luxembourgers were Roman Catholics, and that the remaining 13% were composed of Protestants, Orthodox Christians, Jews, Muslims and those of other or no religion. The Reformation made little headway in this strongly Roman Catholic country. Relatively few individuals accepted the new teaching, which was vigorously suppressed by both church and state authorities. There were no Anabaptists here, as far as is known, until recent times, when Amish Mennonites migrated here from nearby countries. On 13 October 1843, the farm estate called Spittelhof, near Flaxweiler, canton of Grevenmacher, Luxembourg, was rented by Daniel Oesch (b. 1795 in Alsace). In the spring of 1844 he with his wife Elise (nee Beller) and children moved here from Rehlingerhof, near Wincheringen, Germany, and took up residence on this farm. So began the little Mennonite congregation in this little country, with 13 baptized members and 17 children. In 1876 Joseph Schertz from the Saar married the youngest daughter of Daniel Oesch and took up residence near Berdorf, canton of Echternach. In 1892 the Peter Nafziger family migrated here from Liessem, Germany. The Luxembourg Mennonites consist largely of descendants of the three immigrants—in 1955 they were 7 Oesch families, 2 Schertz families, and 4 Nafziger families—a total of 13 families numbering 65 souls, of whom 46 were counted as members of the congregation. A Nafziger family in Liessem and a Guth family in Jagershof in nearby Germany were also associated with this congregation. 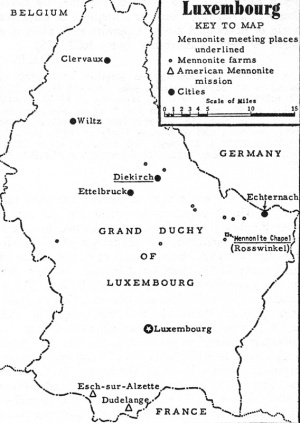 Most of the Luxembourg Mennonites were farmers, located on farms scattered across the north-central part of the country. Elders of the congregation to the 1950s have been Nicolas Oesch (1841-1906, son of pioneer Daniel), Nicolas Nafziger (1849-1922) of Liessem, Germany, Peter Nafziger (1858-1944, the immigrant), and Joseph Oesch (1905-54), who served as elder from 1939 until his accidental death in 1954. The congregation belonged to the Alsace Mennonite Conference in France. Sunday morning services were held on the second, third, and fourth Sunday of each month. Sunday school was conducted for the children. A winter Bibelkurs (Bible Conference) was held annually after 1946. A spring youth day was held in 1939 and several times since. Services were held in the homes of the members until 1948, when a wooden barracks was rented in Diekirch. In 1953-1954 a stone building for worship was built at Rosswinkelhof near Consdorf, canton of Echternach in the eastern part of the country, dedicated 26 September 1954. In the latter 1940s the Eastern Mennonite Board of Missions and Charities (Pennsylvania. USA) took steps to find a location for launching mission work in Europe. Because of spiritual need discovered in the industrial area extending from the southern part of this country to Metz, France, it was decided to begin work in Esch-sur-Alzette, the industrial center of southern Luxembourg. The first missionaries sent were Clarence and Lela Fretz, who arrived in the country on 13 September 1951. Accompanying them were Harvey and Mildred Miller, missionaries sent by the Conservative Amish Mennonite Mission Board, which was also co-operating in this undertaking. The Fretzes were stationed in Esch-sur-Alzette and the Millers in Dudelange, six miles (10 km) away. Gospel services, literature distribution, Bible camps, and boys' and girls' crafts clubs were among the activities carried on to give a Gospel witness in this area in the 1950s. See also Association Mennonite Luxembourgeoise. Hege, Christian and Christian Neff. Mennonitisches Lexikon, 4 vols. Frankfurt & Weierhof: Hege; Karlsruhe: Schneider, 1913-1967: v. II, 708. Mannhardt, H. G. Jahrbuch der altevangelischen Taufgesinnten oder Mennoniten (1888). Meyers, Josef. Geschichte Luxembourgs. Luxembourg, 1940: 149-153. Wikipedia. "Luxembourg." http://en.wikipedia.org/wiki/Luxembourg (accessed 10 February 2010). Fretz, Clarence Y. "Luxembourg." Global Anabaptist Mennonite Encyclopedia Online. 1957. Web. 25 Apr 2019. http://gameo.org/index.php?title=Luxembourg&oldid=145744. Fretz, Clarence Y. (1957). Luxembourg. Global Anabaptist Mennonite Encyclopedia Online. Retrieved 25 April 2019, from http://gameo.org/index.php?title=Luxembourg&oldid=145744. Adapted by permission of Herald Press, Harrisonburg, Virginia, from Mennonite Encyclopedia, Vol. 3, pp. 422-423. All rights reserved.